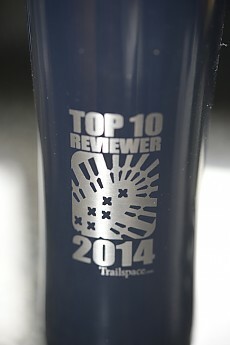 In what can only be described as the greatest prize ever given, the Trailspace 2013 Top 25 Reviewer Water Bottle (mine says, "Top 10"...sorry, Pillowthread) will be proudly displayed on my office desk until the day they fire me for spending too much time on Trailspace. ...but I love this bottle. I would highly recommend that EVERYONE become a 2014 Top 25 Reviewer by posting your gear reviews at Trailspace.com. It's easy. It's fun. It's an excuse to buy and use new stuff ("But, honey, TS is counting on me to test this whatchamacallit by the end of the month!"). And it helps us all to know what's worth buying and what's crap. Gold. I got mine yesterday, and said to hell with the "no carbonated beverages" rule on the warning label and enjoyed a local brew to celebrate....then I promptly washed it out cause I've found smells linger in stainless steelwater bottles. There should be 25 reviews posted on this item, Joseph. Get cracking! Glad you love it, Goose, and that it's bringing you great happiness and self respect. Congratulations! Thanks for the excellent shout-out too. Mine is delayed due to weather from the carrier. Should be here today though!! Mine is on my office desk in front of me now full of ice cold water. Nice little water bottle. I tried to make my kids jealous by telling them how cool it is but they weren't buying it. Kids these days. lol. This may be a dumb question but I am curious. 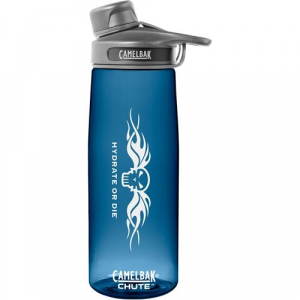 If you take the lid off you will notice a rim above the stainless steel part of the bottle. That rim or lip has 2 notches with arrows at 180 deg from each other. Any idea what those notches and arrows are for? You guys crack me up! Just 17 more and you can begin swinging golf clubs… Hike the course, though. This container is best used by the most experienced of Trailspace’s gear reviewers as a recognition of their multifold achievements in the face of challenging outdoor conditions. It should be proudly displayed on mantles and as ornaments on the dash of their chariots as they head for the hills. Beautiful logo that proclaims to the world the outstanding level of skill, talent, and knowledge of the bearer. Easy flip-top spout cover can be operated with one hand. Flip cover for spout bumps some backpackers’ noses, bothering the less-skilled. Background: One of, if not the, most important practices in staying healthy and safe in the out of doors is proper hydration. 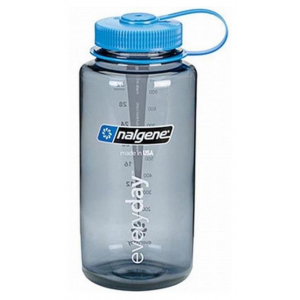 This means carrying and drinking regularly a fluid that provides water at the minimum, plus possibly some energy (sugar, fruit juice), hydration salts (depending on temperature and level of effort), and a good taste. This may be a cold or hot beverage. In some circumstances, the beverage may be an adult beverage or one suited to celebratory activities. 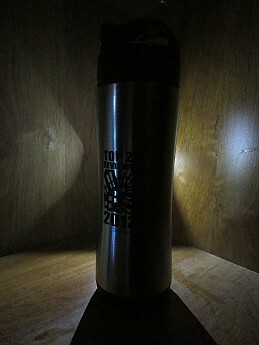 Testing the Top 10 Reviewer bottle on the way out the door for a hike in the woods. Note the second Motus bottle in the pack pocket. Note that the Reviewer is using several other items he reviewed for Trailspace (Beanie is embossed with the Trailspace logo). A basic requirement is that the fluid be contained in a suitable container that does not leak or allow the carried liquid to deteriorate. Another requirement is that the container be light of weight and bulk, as well as easy to access and to imbibe said fluid with all of it passing through the hiker’s mouth to his/her innards without moistening or staining the hiker’s carefully chosen clothing layers. The most desirable of such containers should have appropriate decorations, with the best of these acknowledging and promulgating the hiker’s high level of talents and skills, along with her/his tremendous contributions to humankind and the environment and fellow woodsy folk. 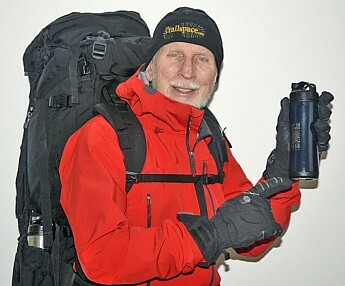 Details: Over the past 7+ decades, I have used a wide variety of containers with a wide variety of fluids during backcountry, polar, and mountaineering expeditions. I have developed a strong antipathy toward the kind of aluminum and glass containers that too many people use only once, then discard along the trail and at campsites. Thus I look for containers made of a durable material that is comfortable to hold and has a high artistic quality. Above the bootprint, I found a label reading “Top 10 Reviewer”. Clearly, this was an acknowledgement of my superiority in conveying abstruse and arcane concepts to the woodsy population. Below the footprint is a date, 2014, and the name of the Awarding Organization, Trailspace.com. In many ways, this container, produced by a company named “Innate”, is similar to another container in my huge collection of fluid delivery devices, but with 3 important differences – the other container has a shiny metal outer shell of stainless steel, an upper label reading “Top 25 Reviewer” (a bit less distinguished recognition), and a date of 2013. Innate is based in Vancouver, Canada, although the Motus bottle is made in China, as is common for many manufacturers these days. 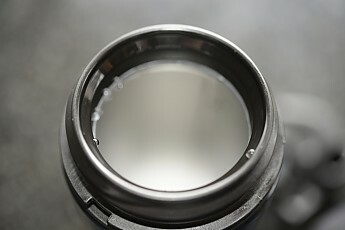 Removing the locking cap from the container revealed that the 2014 “Top 10 Reviewer” version is lined with a stainless inner shell. The shape and “hand” of both the 2013 and 2014 versions is similar and very comfortable. Checking the side pockets of several of my vast collection of packs revealed that both versions will fit comfortably and will be readily to hand. The pour spout is covered by a flip-up cover that, unfortunately, has a couple of minor flaws. First is that the cover does not latch firmly in the notch of the spout. Second is that for some people, the opened cover tends to rest against the drinker’s nose. This latter problem is readily resolved by several simple methods – The flip-top cap is easily removed and replaced from the cap by simply popping it out of the 2 hinge slots. 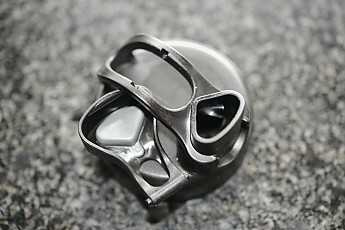 The user can also rotate the container by 90 degrees so that the cover rests against the cheek. The third alternative is to simply unscrew the cap from the container, giving the advantage that the contained fluid can be downed with a single gulp. Arched Loop Design of Container Cap provides for clipping a carabiner to the container and to the backpackers pack or climbing harness. 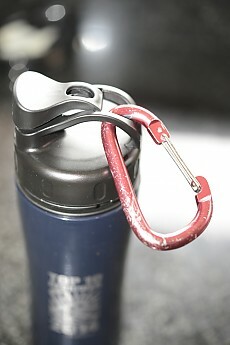 The cap has the spout cover on an arched “bridge” that can accommodate a small carabiner. This allows clipping the container to one’s climbing harness or to the D-ring found on many pack straps. This makes the container readily available for a pause in the middle of a tricky crux on a climb for refreshment and a boost of energy to get over the crux move. The Flip-top Spout cover can be removed and replaced easily, allowing rapid ingestion of refreshing fluids, thus preventing dehydration. The information tag attached to the container has instructions in two languages (English and French), both of which I can easily read (though I can barely speak either). Despite this challenge, I noticed that the English and French capacities agree at 560 ml/18 fl. oz.. To check the accuracy of the label, I measured by filling the container using a proven scientific device to be slightly larger at 600 ml/20 fl. oz. The empty container weighs 200 gm/7.0 oz. When filled with H2O straight from the Hetch Hetchy reservoir (which Governor Moonbeam is intent in diverting to the LA Basin) I noted that the spout cover does leak a few drops when the bottle is inverted and shaken (stir, do not shake!). The tag lists several safety precautions, the most important of which are to not microwave (risky for stainless steel to be in a microwave), do not use with hot liquids, do not freeze (follow Little Red Riding Hood’s dictum of only “just right”), and do not fill with carbonated beverages (“these can cause the lid to eject forcibly”). At the same time, the instructions say “Before using, clean all parts with HOT WATER … if bottle becomes stained use a mixture of 1 tablespoon of baking soda in warm water [hmmm, baking soda in warm water will fizz] … rinse well with HOT WATER”. Curious inconsistency there. The directions also caution against chlorine cleaners. So, this means I can’t purify my stream water with chlorine dioxide tablets. Despite these precautions (I wouldn’t drink bleach straight anyway), the Innate Motus Water Bottle is a superior approach to its primary function of publicizing the awardee’s superior talents and just being an all-around good person, richly deserving of recognition of her/his outdoor skills. Other recognition items, such as paper certificates, are subject to deterioration when one attempts to use them to imbibe celebratory beverages, such as certain fizzly adult beverages. Other recognition items, such as Oscar statues, serve no purpose other than occupying space on the mantle and only add weight when carried into the wilderness. Even more inferior are cash cards, checks, and unused lottery tickets with their false promise of millions of dollars, francs, or Euros. 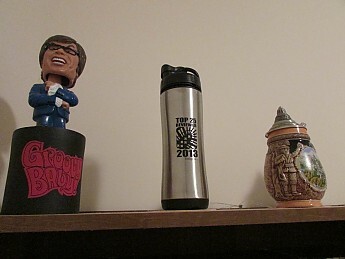 The 2014 Top 10 Trophy prominently displayed on the mantle, along with a 2013 Top 25 Trophy and well-used climbing gear and memorabilia. 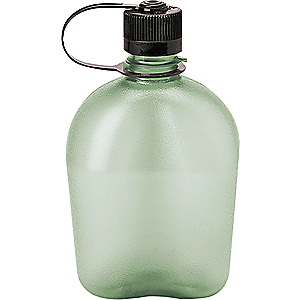 The Trailspace MotusTop Reviewer Water Bottle can be conveniently stored with other containers to preserve its qualities when not in use in the field. 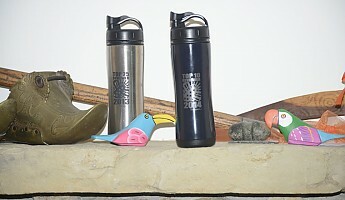 Conclusions: This container is best used by the most experienced of Trailspace’s gear reviewers as a recognition of their multifold achievements in the face of challenging outdoor conditions, including the verification of stove boil times, the insulating properties of sleeping bags during polar blizzards and tropical rainstorms, and the durability of hiking footgear on the rugged trails of the world. It takes great courage and determination, as well as persistence in the face of the forces of nature to do complete tests and in-depth write-ups, despite the threat of carpal tunnel syndrome and “keyboard-itis”. 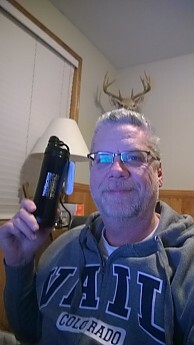 I awarded the Trailspace Innate Motus Top 10 Reviewer Water Bottle a full 5 stars, based on being well suited as a recognition of the awardees accomplishments and contributions to the outdoor world. 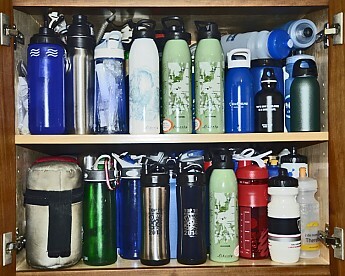 Gee, Bill, do you have enough water bottles? Thank you, Bill! We're very proud to have a place of honor on such an illustrious mantle. Congratulations again! Sounds like you were drinking up this ward! ;) Good review! Sporting the TS bling . . . all you need is a morale patch! I rotate mine 90 degrees to keep my nordic schnoz out of the way, I love it. Informative review Bill, one big take away from this review is not that you have too many bottles but that you have too little bottle storage space. Received my 2014 Top 25 Reviewer Award Trophy (water bottle) today and it has found a home next to my Academy Award, Nobel Peace Prize, and Augusta National Green Jacket. I'll cherish it forever! Kidding aside, I wanted to thank Alicia, Dave, and Seth for such a great site and for hosting a great, outdoor enthused (and participating) community. Over 30,000 reviews have been posted and the variety is staggering. I'd like to encourage all the other subscribers to continue with your postings, even if they are brief, because the more information provided the better when researching gear to buy. For non-subscribers who happen to stumble upon this review, try joining for a while and post some reviews. You'll find this to be a very welcoming group. Post a picture of you holding your major award, and I'll vote for your review of it! Dang! Great review and nice antlers! Very nice-looking bottle. Would hold enough water at hand while hiking, doesn't leak (at least mine doesn't) and the hourglass shape makes it easy for small hands to grip it securely. There are, however, a couple of 'flaws'. First of all I'd like to thank Trailspace for an awesome prize for being a Top 25 reviewer. The hourglass shape makes it easy to grip it with my small hands and it does not leak. The logo on the outside looks cool. Made in China, an issue sensitive with me. I try to always buy American or Canadian-made products. Although it's not entirely easy or cheap, I am suspicious of all things made in China due to their poor track record with health and safety. The spout top lid bumps into the loop on top, and your nose bumps into the whole thing while drinking. I have a small nose, too. Kudos to Trailspace for wanting to give out a nice prize and I am not ungrateful, but I have to give an honest review, so that is what I did. And truthfully, I probably won't use it in the field. You're welcome, Linda. And you wouldn't be a top reviewer if we didn't value your honesty. Congratulations! I rotate mine 90 degrees when I drink and it works great without hitting my nose. Fantastic prize awarded from Trailspace. Didn't have to do it, but they did. 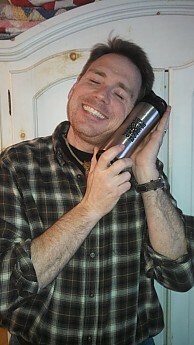 Great company, sleek bottle, proud reviewer! No way G00SE can be outdone, I second everything he’s said. 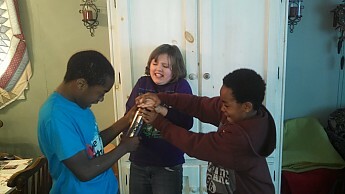 The bottle is great and works like a charm…“works” is the best word, right?! 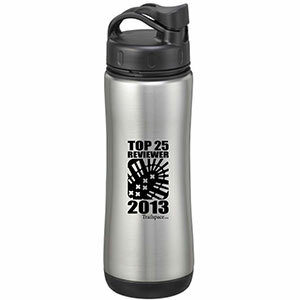 Trailspace has recognized 25 of its top 2013 contributors. They didn’t have to do this at all and that is one reason that makes them great and brings people here to read and write reviews. Ooh, such grace, such class! Trailspace.com is a great platform for us outdoorsy folk to discuss our experience, both good and bad, with one another. The blog and forums are fantastic pieces too that makes them so much more than just a review site. Highly recommend you to take a second, check out some reviews, and feel free to leave one of your own. It’s a great community here and the contributors (those with one review or twenty) are here to help you out! Wonderful review! Applause! Applause! Applause! Thanks for the very kind words, Daniel. Congratulations again! 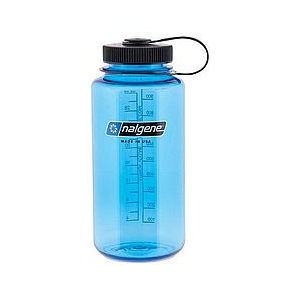 This is a really great water bottle. It doesn't transfer any plastic taste to the water when you drink from it. Thanks, Trailspace for this great prize! I really appreciate it. This water bottle is pretty great. I love that it says "Top 25 Reviewer" on it. If any one of my co-workers tries to 'borrow' it, I'll know immediately. Like another reviewer stated, the flip top lid does bump your nose when you drink. This really annoyed me at first, until I started rotating the bottle 90 degrees before drinking. It works great, but would be even better if the drink spout was shaped with that in mind. It has a very simple design. This might sound like a strange thing to note in a review, but it's very important to me. 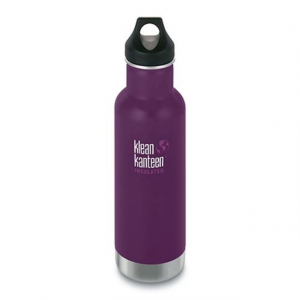 I have had other water bottles and travel mugs that have fancy lids with push button spouts that only dispense liquid when you have tilted the bottle to your lips AND pushed the release button. I understand (sarcastically) that some people may rely heavily on these features to protect them from mistakenly drinking their water or coffee at a time when they have only tilted the bottle to their lips without any intention of actually consuming the afore mentioned beverage. However... I hate trying to clean the lids, knowing full well that all I can really do is rinse the fancy push button valve release mechanisms. When I wash my bottle, I like to scrub each part in hot soapy water. Call me narrow-minded, but I'm just not all that interested in drinking months worth of bacteria. SO... this is why I love the simple lid on this bottle. You can actually see every surface of the lid, and therefore, you can scrub every surface of the lid. The only improvement in this category, would be if it was dishwasher safe. I also like the loop on the lid. I haven't really tested it yet, but I expect it will hold onto a carabiner or piece of paracord to secure it in the bottle holder of my pack. 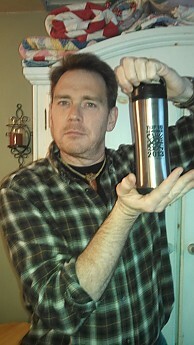 As with most stainless steel water bottles, the water tastes great coming out of it. Congrats malotrekker! Share that bottle with pride! 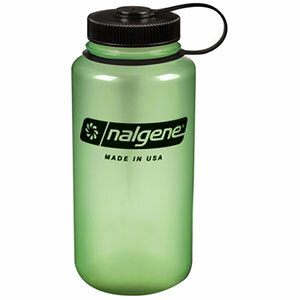 The Trailspace Innate Motus Top Reviewer Water Bottle is not available from the stores we monitor.